Dan yr Ogof National Showcaves of Wales01639 730284work Cave/Cavern AttractionThere are ten attractions all included in the one entry ticket, and there is plenty to see and do for all ages. 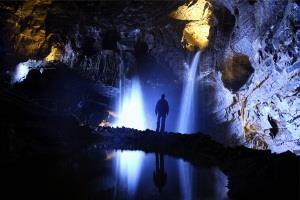 The 3 different caves Dan-yr-Ogof, Cathedral Cave and Bone Cave each offer a unique underground experience. In Dan-yr-Ogof you walk through the beautifully decorated passageways for just under 1 kilometre; in Cathedral Cave you walk through its enormous caverns, carved out millions of years ago, and at the end of this cave experience the excitement of walking behind the 40 feet high waterfalls that cascade around you in the ‘Dome of St Paul’s’, an atmospheric end to a truly wonderful cave; and in Bone Cave learn why 42 human skeletons were buried here, and how our ancestors used caves all those years ago. On site we also have one of the world’s largest collections of life-sized dinosaur models, ranging from the ever popular Tyrannosaurus Rex and Brachiosaurs, to the lesser-known Tsintaosaurus. There are over 200 models here – can you find your favourite dinosaur? The Shire Horse Centre offers the excitement of the 2 covered children’s play areas, the farm yard area, and why not make friends with the gentle giants – the Shire horses who are waiting to say hello. There are ten attractions all included in the one entry ticket, and there is plenty to see and do for all ages. Include the Iron Age village, museum, and stone circles, and you have plenty to see and do for all ages, and for those who may want a break, there is our Coffee shop, and the Rock and Dinosaur shop to enjoy. We are open 7 days a week from April 1st - October 31st. Our hours of opening are from 10am, with tickets available throughout the day until 3pm. 3pm is the last entry time in to the visitor attraction. We also open during December for our Father Christmas experience, and for the February half term week (please telephone for up-to-date information - 01639 730 284). Children - £12.00 (ages 3-16, children under the age of 3 are welcome at no charge). These admission rates allow entry in to all 10 of the different attractions on site, please see our website for further information. If travelling from the South (M4), leave the motorway at junction 45, and follow the signs for the A4067 North (Pontardawe). You will then see the brown tourist signs for Dan-yr-Ogof Showcaves. Follow these signs all the way up the valley; from the motorway the journey time is approximately 25 minutes. If travelling from the North, head towards Brecon. From Brecon, stay on the A40, travelling in the direction of Llandovery. You should leave the A40 just before Sennybridge (a left turn), looking for the brown tourist sign for Dan-yr-Ogof Showcaves. This takes you on to the A4067; from Sennybridge the journey time is approximately 15 minutes. If travelling from the East, head towards Hirwaun, and then take the A465 towards Glynneath. Follow this road down a long lights go straight ahead, stay on this road (for approximately 10 minutes) until you come to a ‘T’ junction and then turn right. This takes you on to the A4067; from here the journey time is approximately 5 minutes. Please see our website www.showcaves.co.uk/furtherinfo/accessstatement.html for our full access statement.